Welcome to the online giving area of Faith Baptist Church! Below, we've provided a brief overview of the online giving process and its benefits. Please understand that NO PERSONAL OR CREDIT CARD INFORMATION IS STORED ON CHURCH SERVERS. All giving is done through a secure gateway backed by a professional service that specializes in processing sensitive financial information. The online giving area is mobile-friendly for those who prefer to use a smartphone or tablet. Authentication ensures you are communicating with the correct server. This prevents another computer from impersonating our giving portal. Encryption scrambles the transferred data so it can only be read by our payment processor. Setting up an online giving account is quick and easy. Once you enter the online giving area, simply click on "First Time?" at the top left of the menu, then fill out the brief registration form. There is no waiting period... you can begin giving right away! Set it and forget it! Recurring giving allows you to set up personalized amounts to be paid at the intervals of your choice (weekly, bi-weekly, monthly, etc.) so you never have to worry about missing a commitment. Review your online giving history with up-to-the minute details about your activity and involvement. To access our secure online giving area, click the button below. 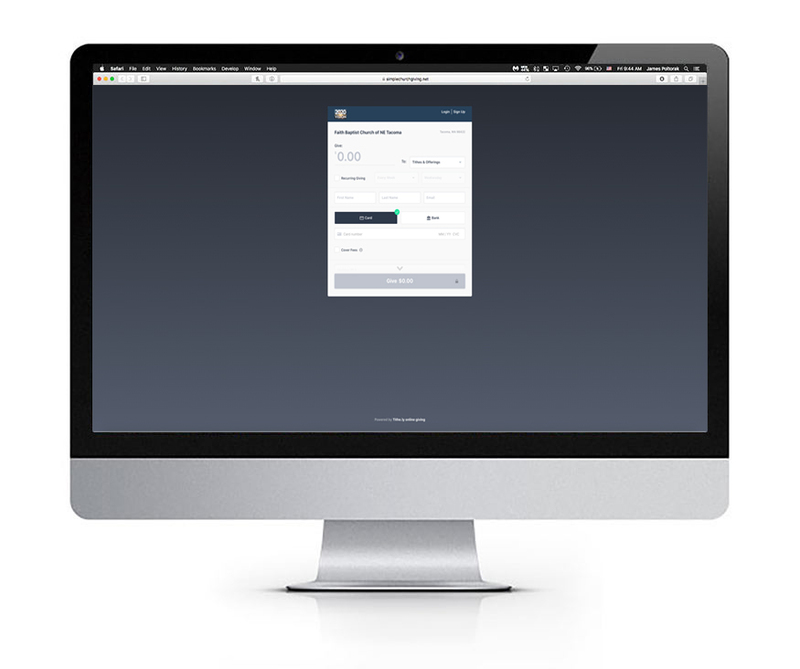 This will open our secure giving portal in a separate window or tab to allow you to easily enter your giving. As stewards of what God has entrusted to us, we desire that every donor have the opportunity to receive a tax-deductible receipt for their donations. However, if you prefer to give anonymously and not receive a tax receipt, simply use the secure "My Online Donation" form instead of creating an online giving account. This form uses the same bank-level SSL encryption as our online giving portal. You will need to enter your card information for payment processing, but Faith Baptist Church will receive a record of the AMOUNT ONLY -- it will not include your name, address, or any other identifying information. Giving online is actually more secure than using your credit card at a gas pump or grocery store! The information is encrypted for transfer, and then stored in a secure location. Can other people see my giving? No, only authorized personnel from our finance department have access to this information. Can I use PayPal to give? You may use your PayPal debit or credit card to give through our online portal. If you wish to use PayPal instead of our online giving portal, please send your donation to PayPal@foundedonfaith.com and in the subject line or notes be sure to specify how you would like your giving recorded. If nothing is noted, we will apply it to General - Tithes and Offerings. Yes, donations to Faith Baptist Church are tax deductible. You will receive a Giving Statement in January for your donations from the previous year. You may use this in preparing your Income Tax. Do you have a question for our finance department? Simply fill out the form below and click the send button.